Pasta lovers have the choice of making their own fresh pasta or buying it packaged from the supermarket. Most people choose the latter option, as it is always useful to have pasta in the cupboard and just throw it into some boiling water when hungry. But the pasta must be well dried if it is to last for so long in the packaging. After mixing water with durum wheat and gluten, the mixture is formed into pasta. It is then stored in a drying room measuring 6 metres in height and 20 metres in length, where the spaghetti and tagliatelle hang like strands of blonde hair on racks. Here they are dried using hot air at temperatures ranging from 100 to 130°C. This process can affect the quality of the pasta. The longer they spend in a drying room, the more gently they dry. This means higher quality and therefore a higher price. Most pasta is dried for around three hours. Fans in the ceiling of the large drying room ensure an even bath of hot air. Previously, these fans used hardwired drives with non-insulated wires screwed into the terminals. But that has its disadvantages. Even experienced electricians require several minutes for connecting each fan – of which there are many in any given drying system. Less experienced electricians need even more time and may mix up the wires. Another time-consuming problem is the risk of fans failing and needing replacement. In a large drying system, an hour of downtime can mean several tonnes of lost production. This is why one of LAPP’s customers decided to use EPIC® connectors to connect its fans. The company is one of the world’s leading providers of pasta production machines. Their largest machines can fill an entire hall. For the next generation of its systems, the company wanted to use connectors that would ensure fast and correct connection and allow the fans to be replaced more quickly. The first attempt using standard connectors failed because they did not withstand the chemical and thermal loads over time. Unlike many applications in the foodstuffs industry, pasta production does not require machinery to withstand aggressive cleaning agents. During drying, however, lactic acid evaporates from the pasta, which can corrode surfaces. Simple connectors with housings made from die-cast zinc were not suitable, even with protective coatings. Sooner or later, every coating is eroded and the less resistant base material is completely destroyed after a short period. The machine builder restarted its search for a supplier and found LAPP, the world market leader for integrated connection solutions. LAPP engineers were invited to visit a pasta manufacturer, in order to see its drying systems in action and develop suggestions for a new way of connecting the fans. The customer wanted a pragmatic solution that was robust enough to withstand the moist, acidic air in the drying room, but that was also not too expensive. This eliminated both standard solutions, which did not offer enough resistance, and stainless steel connectors that were too cost intensive. The LAPP engineers looked for a third alternative and found it in a special copper alloy. This material withstands the required temperatures while still being relatively easy to process mechanically. As a result, the cost of the connector is not much higher than that of a standard product. As the connectors do not come into direct contact with the pasta, there is no need to use FDA-approved material. They are also cleaned mechanically instead of using water or chemical cleaning agents. A potential alternative with chemical resistance would be plastic. But without a coating, these connector housings would offer no barrier against electromagnetic radiation. As the customer required controllable motor speed, this would also be a problem due to the need for shielded cables. Most plastics do not provide the degree of mechanical stability that is required in order to maintain the necessary seal after many years of use. The copper alloy used was the ideal compromise, as it offered permanent chemical resistance against lactic acid, good EMC properties and mechanical stability. 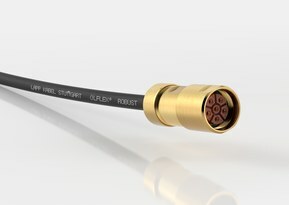 Although the connectors are slightly more expensive than the standard product, they cost much less than an alternative product made from stainless steel. In comparison, a stainless steel connector would cost three to five times as much as a standard product. “Together with the customer, we developed the connector system and tested it thoroughly for a year. In food production, it is important to consider and test for every eventuality”, said Joachim Strobel, product manager for EPIC® connection systems at LAPP. To prevent flour dust from settling, the EPIC® connector is designed with as few edges and corners as possible in accordance with hygienic design principles. Here too, the copper alloy offers a number of advantages. It has a smooth surface, even without a coating that could flake off and fall into the product zone. Stainless steel is relatively rough by comparison and can only be made smoother through intensive processing. There is of course more to a connection solution than just the connector, which means they are only as strong as their weakest link. In other words, attention has to be paid to the cable as well. If it is too thin or has an unsuitable surface finish, it may move around inside the connector opening and become frayed over time. 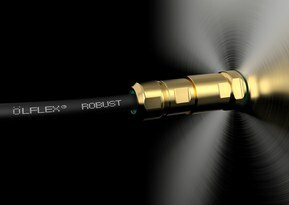 Just like the connector itself, the cable also has to withstand mechanical stress, lactic acid and heat. The company chose silicon cables, which were better suited than standard products. LAPP offers silicon cables that resist plant and animal-based oils and greases, as well as temperatures of up to 180°C. To prevent errors during assembly, LAPP recommends pre-assembled cables and connectors. LAPP also refuses to take any gambles when it comes to the seals inside the connector. These are made from fluorinated rubber (FKM), a premium sealing material with a wide range of uses. The customer tested the new connector with patented connector geometry for one year in one of its production systems. The test was successful and technical approval was granted. The new connector will be used on the fans in the coming generation of drying systems. “We see great potential in this connector design for more applications in the food industry, possibly even stainless steel variants”, said Joachim Strobel. He explained that manufacturers of machines that process foodstuffs often do not know which cleaning agents customers will use on the machines. Often, even the food manufacturers themselves do not know. This is because cleaning is often outsourced to subcontractors who do not always provide precise information about the substances they use. But this case shows that when working together with the customer, LAPP’s engineers can find the right solution.